An elephant is killed every 15 minutes in the world.Poachers have effectively wiped out the elephant populations from Western and Central africa and are nor rapidly decreasing the populations in the Eastern and Southern portions of the continent. The species is rapidly disappearing from the earth thanks entirely to the demand for ivory. 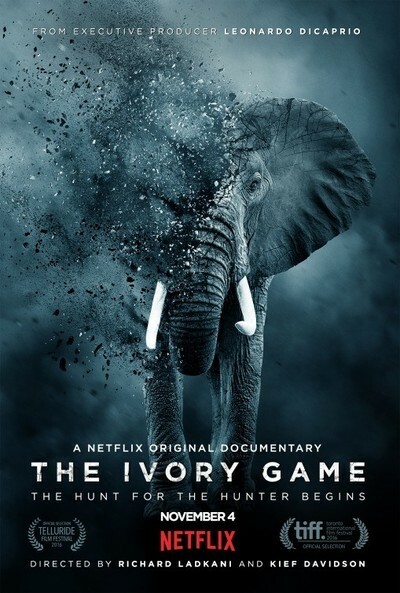 The Netflix documentary THE IVORY GAME seeks to tell us everything we need to know about the ivory trade. From the animals themselves, to the poachers, to the shippers, the sellers and the buyers this film lays it all out. Its a sad story that reveals how much is being lost for such a small an indignicant thing, These huge beats are being lost simply so that something that will collect dust can be created to sit on a shelf. I suspect that I could understand the destruction of the populations of elephants if it as for more than just the animals tusks. If the whole animal was being used and the meat was feeding starving villges I could accept it more readily but inatead the animals are killed, the Ivory is removed and the rest left to rot. Not only is it a shame but it's a waste. As a film and not a call to arms, THE IVORY GAME is a good but not a great one. By trying to cover it all the film never fully feels entitrely focused. What I mean by that is it wants to get the entirety of it's story it. It wants to make sure that we are aware of everything with the result that there were a couple of times where I wished we had spent more time exploring the thread. Even the elephants in away are a commodity and we are not given a minute to soak in their grand majesty, The film opens with a raid on a poacher and it goes from there. We never seem to pause and really look at and appreciate the very thing that the film so desperately wants to save. We only see them as the object at the center of the film and not the awesome creatures they are. I like the film, but I don't love it. It never fully moved me emotionally. That said it is a spectacular looking film with an important message and is definitely worth your time- especially on a big screen where the shots of the elephants will take your breath away.